Democratic hopefuls are fighting for the scraps of the spotlight from Hillary Rodham Clinton in New Hampshire. DURHAM, N.H. — Martin O’Malley, the former governor of Maryland, got almost all the way through his pitch to a packed living room recently before the Democratic presidential hopeful was hit with a familiar question. “How do you see yourself as distinct from Hillary?” asked one guest. O’Malley, tie loosened as he stood before a wall banked with signs bearing his name, rocked back and smiled. “The distinct-from-Hillary question,” he joked. 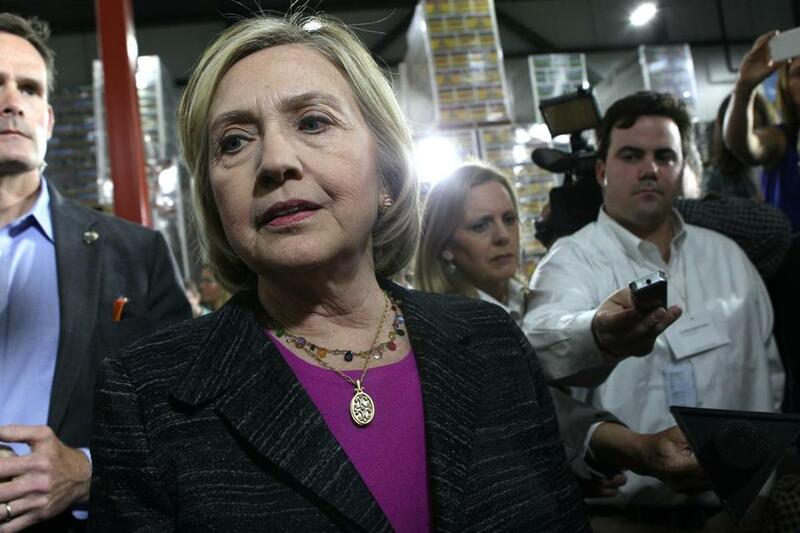 Benghazi issue follows candidate to N.H.
Hillary Rodham Clinton looms larger in the New Hampshire primary than any of the other Democratic hopefuls — combined. So it is almost without fail that her foes get asked a Clinton question while in the Granite State, much to their chagrin. And, as Clinton completed her much-publicized second trip to New Hampshire on Friday, her likely Democratic rivals are still fighting to be known. The four seek to set themselves apart from the Democratic front-runner, declaring their differences with subtle and overt references to areas in which Clinton has taken considerable criticism. O’Malley and Senator Bernie Sanders run to her left on income inequality; former senator Jim Webb emphasizes his resume and military background; former governor Lincoln Chafee talks about his opposition to the war in Iraq. While Clinton’s every move is parsed by the national media, her opponents hunger for attention, pleading their case in church basements, bookstores, and bars. New Hampshire has long been Clinton country, and the former US secretary of state has leveled considerable resources here by hiring staff, opening a campaign office, and amassing more than 1,000 volunteers online, according to her team. Already this cycle, she has won support from the state’s top Democrat, Senator Jeanne Shaheen, all the way down to the first vice-chair for Portsmouth Democrats, Laurie McCray. Ideology plays a part in that search for an alternative — and for the unaligned political operatives looking to gain experience, so does professional development, said state Representative Katherine Rogers, who once worked for President Carter and Vice President Walter Mondale. Clinton’s camp is filled with the state’s top Democratic operatives, and political hands, she said, have a choice to make. They can either be a little fish in the Clinton pond or “be the biggest fish in the little pond,” she said. Some Democratic activists said they worry about the outsized nature of Clinton’s campaign, asserting that New Hampshire voters play a critical role in the electoral process by vetting presidential candidates. That’s why they’re wary of what critics call a “coronation’’ of Clinton some nine months before voters go to the polls. New Hampshire is a state where, as one Democratic activist put it, the candidate who shakes the most hands twice usually prevails. 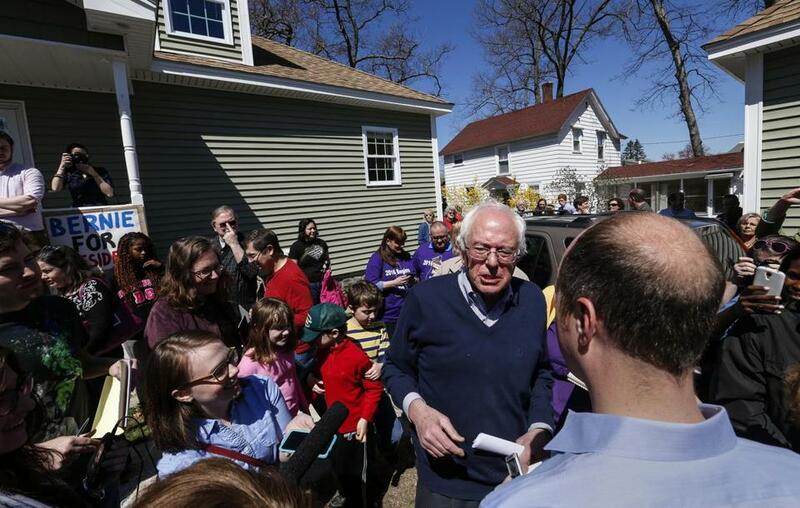 Bernie Sanders was in Manchester, N.H., earlier this month for a house party. Thus far, all but one candidate has obliged. Most of Clinton’s challengers have visited the state more often than she has this presidential cycle, and they’re holding events that are mainly open to anyone who wants to attend. By contrast, Clinton’s events have been invitation-only. Sanders, an independent Vermonter who is seeking the Democratic nomination, returns Wednesday for two town hall meetings and a house party. Chafee of Rhode Island – who has yet to formally declare his candidacy – returned Tuesday to speak with Merrimack County Democrats, and on May 31 he’ll serve as keynote speaker at the Rockingham County Democrats’ annual clambake. And Webb of Virginia is exploring a run, recently wrapping up a two-day visit to the Seacoast area, a Democratic stronghold. It was his first trip to the state since October. 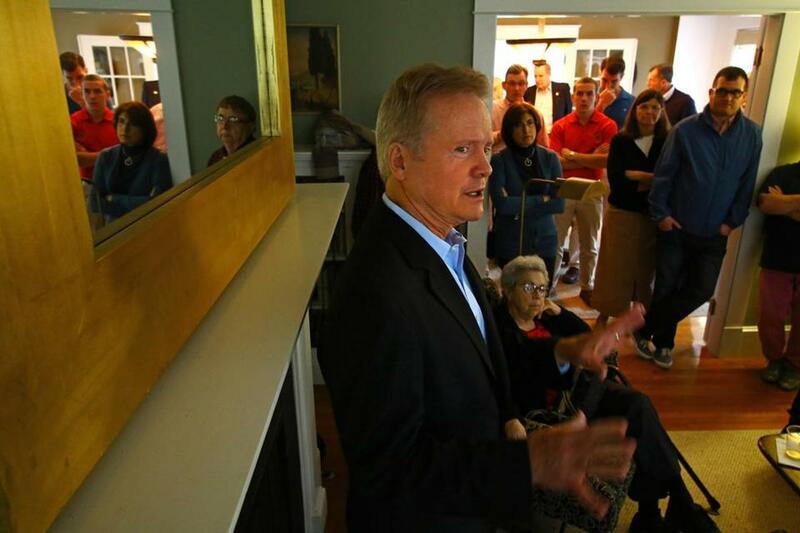 Jim Webb campaigned in New Hampshire this month. Before Friday, Clinton only had made one, daylong trip to New Hampshire, where she spoke to small groups at a manufacturing business, community college, coffee shop, and house party. 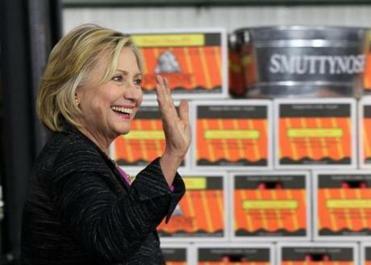 Her Friday trip included two announced events: a “small community” discussion at Smuttynose Brewing Co. in Hampton followed by a grass-roots organizing event in Exeter. By contrast, O’Malley has made numerous visits, playing his guitar before young voters at a Nashua lounge and giving a policy talk to business leaders at the speakers series known as Politics and Eggs breakfast. During O’Malley’s most recent trip, he started the day at a Manchester diner and ended it at noted activist Dudley Dudley’s house party. And again at the Dudley house party, where attendees sipped wine from Trader Joe’s, they peppered O’Malley with questions — including the familiar one. This time, he offered an explanation. Speaking now to the activists, O’Malley said that if he announces a run, as he is widely expected to on May 30, he would choose not to define his campaign by his comparison with Clinton, or any of the other Democratic contenders, but would offer a positive reason to choose him. Akilah Johnson can be reached at ajohnson@globe.com. Jim O’Sullivan at jim.osullivan@ globe.com. James Pindell at James.Pindell@globe.com.